Alaska is where we raise our families, participate in our community and embrace our unique culture. This is not a seasonal adventure for us. This is our home. We invite you and your entire family to come see why staying at Bear Trail Lodge feels like you have finally come home. You will be in remote Alaska. But don't worry, you won't be "roughing it" exactly. Our premier lodge has a full team ready for your arrival from elite guides to gourmet chefs. And, we haven't even mentioned the best part yet: the silence. It's time to disconnect to reconnect. Our guides are what your next memories are made out of. We proudly employ local Alaskans so our clients experience Alaska from the people who know it best. 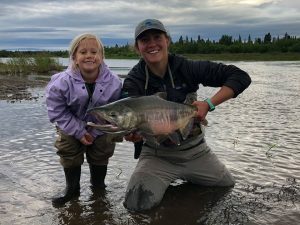 Learn about the land, the people and the customs of Alaska when you fish with our team of locals and honorary locals. Hike through the tundra to remote streams. Raft down creeks where there's no road access. Fish for the almighty king salmon. Spey fish in secluded tributaries. Here, the days are filled with limitless opportunity. 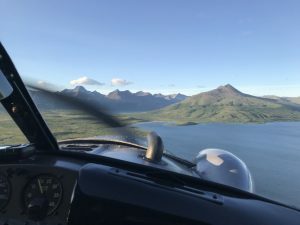 This information is pretty handy when you are planning a trip to Alaska. Nearby airports, hotels, flight information and other resources. What you should not leave home without. What you can leave behind. A complete list of what you need to bring on your big adventure. Balance due 30 days prior to reservation. No refunds, so consider trip insurance. We accept all major forms of credit cards as well as check. Pretty much anything shy of Bit Coins and first-born children. Need synergy and the ability to connect with the people you need the most? Our remote location is ideal for group events as it can be rented for exclusivity.